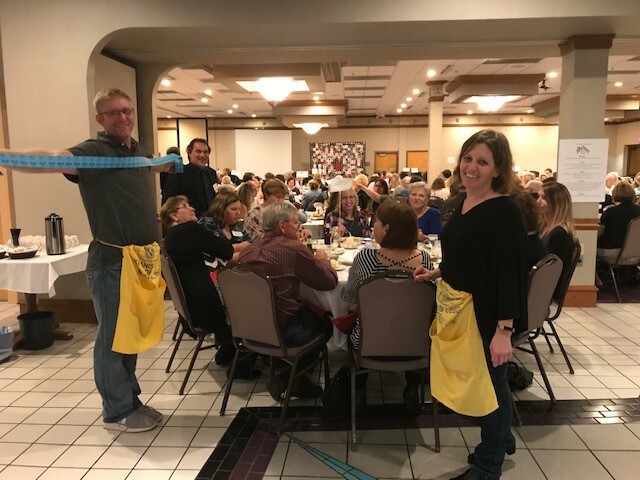 On October 3, 2018, Pillars Adult Shelter (formerly Fox Valley Warming Shelter) hosted their annual Grateful Plateful fundraiser. The event raises money to help Pillars fulfill their mission of providing meals and overnight, temporary shelter to homeless adult men and women throughout the community. WOW – WE CARE CHARITY was one of the sponsors for the event. In addition to monetary contributions, we prioritize coordinating volunteer opportunities for WOW Logistics employees within the organizations that we support. Amy LeGrand, a WOW Logistics employee, and her boyfriend, Paul, volunteered at the Grateful Plateful fundraiser and said it was a busy and exciting night!